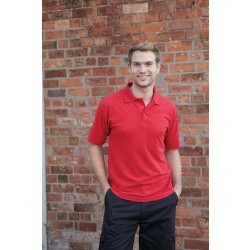 Our range of polo shirts and t-shirts are sold in 10 different colours and various sizes to accommodate all needs. Designed to be easily printed on or embroidered, this could be the perfect addition to your team’s uniform. Good value for money, polo shirts from System Hygiene have been created with comfort in mind thanks to its taped back neck and tight knit construction. Complete with a spare button, this range of polo shirts are smart and comfortable. Perfect for incorporating into your uniform to ensure your staff look presentable and consistent at all times.